Life outside of Saint Rose has been just as busy as my life in it– I’m getting ready to study abroad! I am a senior at the college and will be spending my last semester abroad in London. So far my summer has consisted of working non-stop, getting my things together before I leave for Europe, and spending as much time as I can with my family. I hope everyone is excited to come back to campus. Welcome back, fellow upperclassmen, and a huge welcome to all of our newcomers! Check out my blog to follow my study abroad journey this semester. So basically this summer has been a little out of the ordinary because I had my first-ever surgery on my shoulder and I’ve been rehabing my torn labrum. Aside from all that fun, I’m also recording an album of song covers I liked. I’m really excited for Ultimate Frisbee to start up again and to get back at my blog series, the Golden Knight Spotlight! Stay tuned for more. If I could use one word to summer my summer, it would be “Work.” I’ve been working seven days a week, and whatever free time I have has been used prepping to move back to Albany, trying to relax (which is pretty much impossible). During the month of June I began working at my local Stewart’s Shop, coming home with arms covered in ice cream. Luckily, getting a job equals getting a paycheck, which equals having enough money to have a good time in Lake George with my best Saint Rose friend and former-future roommate…and WE WENT PARASAILING. Pro tip: Parasailing is amazing. July has been spent continuing work at Stewart’s, chasing around eight-year-old kids at camp all day (AKA job #2), prepping for school and for being an RA! The first week in July I got a phone call saying an RA position opened up, and I accepted! Hence why my friend will no longer be my roommate (insert sad face here). My July was spent working at a local Cub Scout Camp chasing around kids all day. It’s difficult, it’s frustrating, but it’s rewarding when those kids look at you with laughs and smiles. I scoop ice cream (among other things, like stocking shelves, working a register and all that). Sleep? what is that? Free time? A joke. I haven’t slept in past 7:00AM since the last week in June. While my summer has been terribly busy, and stressful, and tiring, it’s also been incredible. 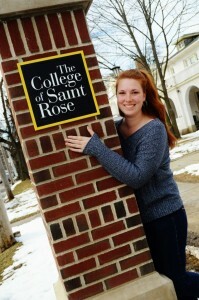 However, I can’t wait to come back to Saint Rose in a few weeks, so I can finally, maybe, relax and sleep in! Or not…. Whats up Strose?! This summer has been pretty packed for me. It’s my fifth year working at a summer camp; and my second as a music teacher/supervisor. I recreate modern pop hits into age-appropriate camp songs that the children then sing for their parents. I know, it’s the dream. I’m a big concert goer as well. This summer I’ve seen the Boys of Zummer Tour with Fall Out Boy, Wiz Khalifa and Hoodie Allen. I’ve also been blessed to be in the presence of Taylor Swift for the 1989 World Tour. I’m excited to be going back to Saint Rose this semester. Remember, I haven’t been there since December 2014. That’s way too long of a break. I’ll be taking a full 18 credits of joy and love come the fall. Wish me luck! You’ll be reading my ramblings about it soon enough, although I promise to not make the blog too school-centric. I try to plan something fun every weekend in school in order to see the light at the end of the MLA-induced-coma. Have a great summer everybody! Talk about surreal; I’m now officially an ALUMNI blogger! WHAT. First of all, how did that happen? Second of all, what do adults do in the fall instead of going back to school? It’s a very weird feeling. However, I was so excited when Mike reached out to me about this collaborative blog. What have I been doing all summer? Well, let me tell you- post-grad summer is WEIRD. It’s been a huge learning experience and has also brought me a lot of fun. The internship I had over the spring semester unfortunately did not have any job openings for me to possibly fill. That was kind of a downer, but I got a great experience there so it was nice to have to add to my resume. Coming out of college, I did not have any jobs lined up (besides my trusty summer restaurant job!) so that put a little stress in my life. I’ve been applying and applying for jobs at home in the Rochester area, but haven’t heard back from many yet. Who knew it took three months for companies to review resumes and get back to applicants! (I’m sure it’s a commonly known thing, I just didn’t believe it when people claimed that was a thing.) So in the end, it’s been great to have the non-serious restaurant job to make money, have fun, and make some local connections. Other than that, I’ve been having fun reconnecting with friends that I haven’t seen in a while and spending time by the pool with my family! And obviously snuggling my dog after suffering from separation anxiety with her for the past four years. It’s definitely going to be strange not having to pack up my bins and load up my car at the end of August this year, but I know that the future holds great things for me and for all of the other recent graduates! Wishing all of the seniors nothing but happiness and success this year- it goes by much faster than you think it will! I’m currently suffering from separation anxiety from my second home. It’s been two months since I was roaming around our beautiful campus, giving tours, consistently putting out blogs (I’m sorry), playing frisbee with the team, and *ugh* I just miss it all. I’ve been trying to come up every few weeks to start setting up my future home in Albany. That’s right, your boy is slowly becoming a man (send help). However, since I am home and need activities to pass the time, I’ve been keeping pretty busy! Aside from casually writing blogs, which you can check out here if you missed any, I now have a job at home! Now, if you know me personally, you know this is totally new for me due to a long string of events and excuses that have prevented me from actually getting a job. However, I have one now, so it’s okay. I’m currently an associate at a retail store in the Poughkeepsie Galleria, the closest mall by my house. I’m sure I’ll blog about the horrors of retail in the near future. I went to Vans Warped Tour this year for the first time along with going to a Nothing More show and saw some of my favorite bands! Not only did I get to scream some of my favorite lyrics alongside my friends, I held my own in the pits. Keep in mind that I am 150 pounds of mostly water weight, I should be dead. I had fun though, so that’s good, right? One last thing that I’ve been doing; I’ve been helping my friend pursue his YouTube dream. For once, I am not in front of the camera, I am actually behind it where I belong. He reviews metalcore bands, albums, singles, tracks, etc. With less than a month until I return to my home away from home, you could imagine my excitement. I’ll be back soon to roam around campus again for my junior campaign. Big things are coming and I can’t wait to unveil them all. After graduation I hung around The Capital Region for about a week with the people that became my second family. We did a lot of adventuring, ate some pretty tasty blue cheese fondue, and they even threw me a super sweet surprise graduation party. Staying a week later also gave me time to digest the fact that I actually graduated before swinging to Massachusetts to pick up my best friend for my move to Texas. I opted to turn my move into a three day road trip because driving long distances was never something that I had done before and seemed like something I might never have the freedom to do again. Along the way my friend and I stopped at Gettysburg, some sketchy towns in the middle of nowhere, and I was lucky enough to get a speeding ticket in Virginia. There was something really cool about just casually swinging through places like New Orleans for lunch before eventually reaching my new home of Houston and consequently a new phase of my young life. I’ve been here for about two months now and have been taking my time to find the perfect job. Although it would be awesome to have a job already I am taking in the time to relax and make sure I sign up for something that will make me happy. In addition to applying/interviewing for jobs I have also made some new friends, explored parts of my new city, and have been getting involved in the community through volunteer work. Of course I still do random “Courtney things,” like when I bought my new typewriter from a lady in a dog park parking so life hasn’t gotten too boring. Until something monumental happens to cause me to write an alumni blog I’ll leave you with my word that things really are bigger in Texas… especially their flags, they are seriously the size of houses. ← Saint Rose Alumni Night with the ValleyCats!